Not all courses available by distance every year. Through the equine major, you will gain the knowledge base and skills to meet current and emerging opportunities in the equine industries. It is structured to support strong links with equine industries in New Zealand. Massey is world-ranked and New Zealand’s No 1 university in agriculture according to the QS (Quacquarelli Symonds) rankings. Our proud record dates back to 1927 when we offered New Zealand’s first degrees in agriculture and horticulture. As a student, you will benefit from our internationally-recognised capability and leadership in this area. Massey’s Manawatu campus hosts the only multi-function teaching laboratories in Australasia. The labs, built in 2010, won a Best Practice Award for Innovation at the Association for Tertiary Education Management conference in Australia and was shortlisted for the international UKS-Lab awards. Our Student Exchange Programme provides an international experience with the chance to study courses at overseas universities and cross-credit them back to a Massey qualification. You’ll pay the same tuition fees while abroad and it’s a great chance to gain the overseas experience and knowledge that many employers value. Some of the top science universities available within the exchange programme are the University of Calgary, Canada, Wageningen University, The Netherlands and the University of Edinburgh, Scotland. Your learning will cover the scientific principles of equine husbandry, agriculture, and agronomy with business skills. You will learn about equine health, nutrition, reproduction, structure, and function. You'll also obtain knowledge of production and management issues, including equine welfare and regulatory issues. You’ll develop problem-solving skills and learn how to analyse a range of theoretical and practical problems relevant to the equine industry. You will develop skills in written and oral presentation, information technology, innovation, and working with professional colleagues, clients, and employers. You can continue to gain postgraduate qualifications if you wish to specialise further. The agricultural science degree prepares you to apply and integrate scientific, technological and business knowledge to meet current and emerging opportunities in the primary industries. It will prepare you to take future leadership roles in this sector that continues to underpin New Zealand's economy. Over $500,000 worth of scholarships are available in this area. Are interested in helping come up with solutions to contemporary New Zealand animal husbandry and agricultural issues. I’ve always wanted to work with horses but I knew I needed to gain a qualification and experience to be successful in the industry. 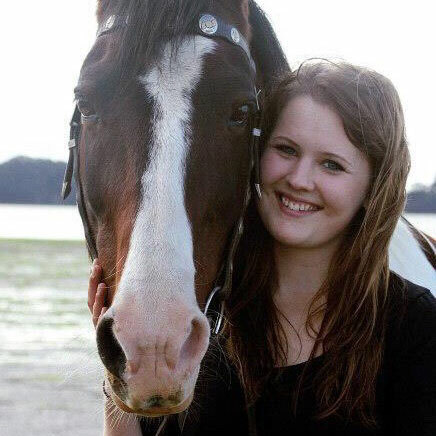 I chose to study equine at Massey because I thought it would provide me with a great head start in finding employment. The degree has been a constant challenge but what I have learnt is invaluable and I will always be thankful that I chose to get a degree that set me up for the industry. Job opportunities began opening up quickly, and I had a job lined up long before I had completed my degree. I work for IRT which is an equine quarantine facility in Auckland. The job involves daily care of a range of horses, making sure they are healthy after long travelling periods, and running regulation tests to ensure no diseases are being brought into the country. I love horses because no two horses are the same. They challenge me on a day-to-day basis and keep me on my toes. The equine industry is large, diverse, and economically important both in New Zealand and worldwide. The equine major will prepare you for a career in a wide variety of equine enterprises anywhere in the world. You will acquire a broad understanding of health and production issues, and you'll be able to offer the equine industry up-to-date, scientifically-based knowledge. Potential employers include equine regulatory, breeding, racing, breed, and sport organisations, and other equine enterprises in New Zealand and around the world.